The scraper digs and dumps soil and levels land. Fresno Scrapers like this one dug irrigation canals and ditches, and helped to build roads, railroads, and dams. 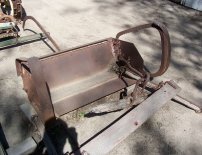 This scraper is pulled by two or more horses. The angle of digging can be adjusted by pulling the bars. The back handle is used to dump the load. This one was in common use in the 1890's. It was replaced in the 1930's by gasoline engine powered tractors. For centuries, the soil of the earth has been moved by mankind for agriculture and construction. In some underdeveloped countries, it is still moved in baskets, carried on the head, or hung from a pole slung across the shoulders. The earliest use of draft animals to pull the Slip/Scoop. The next advance in the mid 1800's has a cross bar which may be adjusted on the bowl side plates to vary the limit position of the bowl as it strikes the tongue. The side runners or shoes raise the cutting edge above the ground. This allowed some control of the dumping of the dirt. 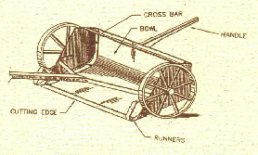 Unfortunately, the iron wheels and short runners sunk into soft or sandy soils and the scraper could overrun the horses on firm down slopes. James Porteous in 1896 perfected the scraper which became known as the "Fresno Scraper". They were sold throughout the west, and later the world, when their reputation for efficiency, reliability and ease of operation was established. Tilting the handle allowed full control of both the scraping and filling depth as shown below.